Communicating successfully with customers is an essential part of doing business, and many businesses work hard to have good communication with their customers. But, when dealing with customers who are blind or have low vision, customers who are deaf or hard of hearing, or customers who have disabilities that impair speech, many business owners and employees are uncomfortable or are not sure what to do. This lesson provides the answers. Under the ADA, businesses are expected to communicate effectively with customers who have vision, hearing, or speech disabilities, and are responsible for taking the steps that are needed for effective communication. Business owners or managers must decide what assistance is appropriate, depending on the nature of the communication and the customer’s normal method of communication. The rules are intentionally flexible. Different businesses - a lawyer’s office, a restaurant, a theater, and a grocery store, for example - may need different solutions, because the nature of their communications are different. Also, different customers need different solutions, because the nature of their disabilities are different. In a department store, a man who is deaf is purchasing shirts. A sales clerk is writing a note to answer a question he has asked. 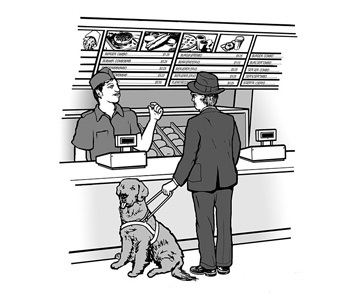 At a casual restaurant where the menu is posted on the wall, a cashier is reading the menu to a man who is blind. The aim is to figure out practical solutions that allow you to communicate with customers who have disabilities, fit with your type of business, and comply with the ADA. Some easy solutions work in relatively simple and straightforward situations. Other, more extensive solutions are needed where the information being communicated is more extensive or complex. You can speak or read information to a customer who is blind or has low vision. You can use facial or body gestures that express information, point to information, or write notes to communicate with a customer who is deaf or hard of hearing. 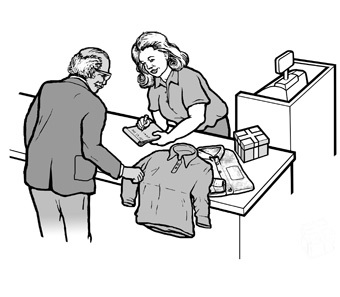 Customers who are blind may also need assistance in finding an item or in manuevering through your business’s space. For people who are blind or have low vision, printed information can be provided in large print, in Braille, on a computer disk, or in an audio format (such as an audio CD, casette, or MP3 player), depending on what is usable for the particular customer. A magnifying glass can also help a person with low vision to read printed materials. For people who are deaf or hard of hearing, spoken information can be provided using a sign language interpreter, an oral interpreter, a printed transcript of the words that are usually spoken, or a service called “real-time captioning” which is explained later. Usually the customer will tell you what technique he or she needs or will ask which ones you provide. Or, you can ask what technique he or she normally uses to understand printed information (if he or she has a vision disability) or spoken information (if he or she has a hearing disability). This information is helpful in deciding how to provide effective communication.